John Hopkins is executive director of the Buckeye Shaker Square Development Corporation, the neighborhood’s nonprofit development organization. He’s been helping me and Seth since before we moved in, assisting us in our search for space and providing invaluable information about Buckeye’s past and present. No wonder: He’s worked at BSSDC for 12 years, first as housing director and then taking over the executive directorship a few years ago. This morning, I walk into his office intending to have a general conversation about the neighborhood and his time here. Instead, we spend almost our full hour together discussing the subjects that seem to be top of mind for so many of the residents and merchants we’ve talked to so far: Crime and public safety. Part of the reason is that Hopkins is in the midst of planning the neighborhood’s first-ever public safety summit next week. It’ll be held outdoors, in tiny Art and Soul of Buckeye Park at E. 118th and Buckeye, right next to the BSSDC office. A commander from the Cleveland Police Department will answer residents’ questions and concerns. To that end, he’s asked our friends at Neighborhood Connections to facilitate. Echoing what others have told us, Hopkins says crime in Buckeye is down overall, but that drug dealing has been persistent. In turn, activities related to dealing, such as loitering youths, create perceptions of danger that are often worse than the reality. Exacerbating the appearance of danger is the commercial vacancy rate. At present, nearly half (48%) of Buckeye Road’s storefronts are empty, compared with 17% in 2003. He says this emptiness and blight is what the neighborhood’s residents most want to see addressed. Out Hopkins’ office window, I notice a small, elderly woman emerge from a storefront next door. She’s sweeping Art & Soul of Buckeye Park with a straw broom and upright dustpan. “That’s Sue, from Sue’s Wig Shop,” Hopkins says, following my gaze. Her store sits immediately adjacent to the park’s west side, and Sue takes responsibility for keeping the park tidy. She’s a Korean immigrant, he explains, whose husband ran a barbershop right next door. He was shot and killed during a robbery 20 years ago. Sue stayed because the wig store was her life. The unfortunate prevalence of stories like this - a legacy of the days when Buckeye was more dangerous than it is now - prevents many people from visiting the neighborhood, Hopkins says. That’s especially true of families of both Hungarian and African-American heritage who once lived here but have since moved to the suburbs. Talk moves, as it has so often in our short time here, to the group of youths we’ve been told are involved in drug dealing. Hopkins says finding jobs for neighborhood youth is problematic for three reasons. First, they may not have necessary skills or education. Second, available jobs are often located far afield -- in Solon or Mayfield, for example, requiring an arduous, transfer-filled journey on public transportation. Third, and perhaps most fundamentally, there’s the question of whether any “legitimate” job will be more financially and intellectually rewarding than dealing. Perhaps the question of how to provide youth with attractive alternatives to crime will be part of the discussion at the public safety summit. It’ll be held Thursday, June 18, at 6 p.m. in Art & Soul of Buckeye Park, on the southwest corner of E. 118th Street and Buckeye Road. 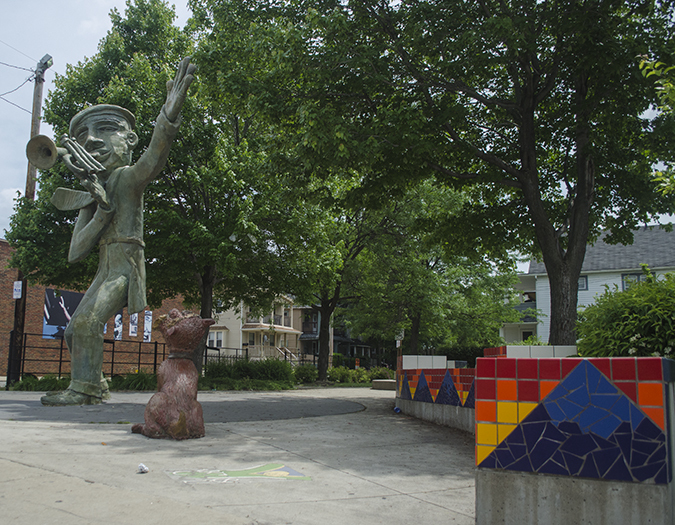 Art & Soul of Buckeye Park, site of this week's public safety summit. Coming up in our next post, Seth and I meet a librarian and a public school activist - both single dads - who pretty much define what it means to care about where you live. Until then, thanks for reading our first week of posts from the Sidewalks of Buckeye! This project is a work in progress, and we’d love to hear your comments about what we’re doing - good or bad. Post here, or email us!